Keurusselkä is a lake in Central Finland between the towns of Keuruu to the north and Mänttä to the south. It covers an area of 117.3 km2 . Its average depth is 6.4 m with a maximum depth of 40 m . The surface lies at 105.4 m above sea level. The lake is 27 km long and is a part of the Kokemäenjoki water system. Keurusselkä gained international publicity in 2004 when a pair of amateur geologists uncovered an ancient impact crater on the western shore of the lake. In 1986, the Keurusselkä region was heavily contaminated by radioactive caesium, 137Cs, from the Chernobyl disaster fallout. 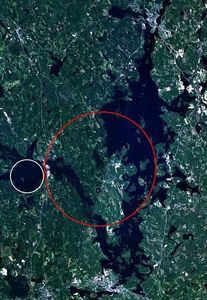 In 2003, some fish near Mänttä still had caesium concentrations several times higher than in Olkiluoto and Loviisa, which host the nuclear plants of Finland. This is due to the difference between the uptake of caesium in fresh water and brackish or saline water. However, the concentration levels are so small that eating the fish is not considered a health risk.